Jason R. Kelly G receives his doctoral hood for completing his degree in Biological Engineering at the hooding ceremony in Rockwell Cage yesterday. Ten thousand people are expected to attend this morning’s Commencement exercises, at which a Nobel laureate will speak and about 2,300 students will receive almost 2,600 degrees. 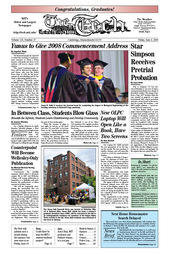 Star A. Simpson ’10 was sentenced Monday to one year of supervised pretrial probation on a charge of disorderly conduct. The charge stems from a Sept. 2007 incident when she was arrested at gunpoint at Logan International after airport personnel mistook a circuit board on her sweatshirt for a bomb. The incident — and MIT’s public relations — incited national and local controversy. One Laptop Per Child unveiled the next generation of its XO laptop last month. The new machine is smaller, cheaper, and will open like a book to reveal two touch-sensitive displays. The mission may not be over after all for the Biodiesel@MIT team, which three weeks ago was prepared to abandon its two-year project in the face of insurmountably high costs.